The launch was Arianespace's fifth with O3b satellites since 2013. Credit: Arianespace webcast. 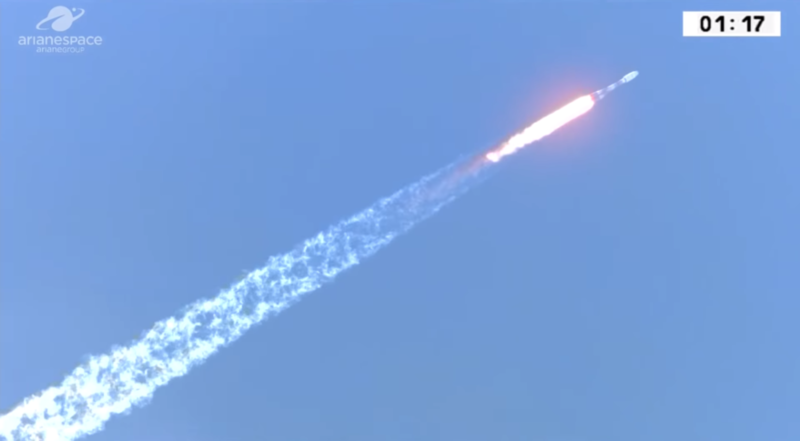 WASHINGTON — European launch provider Arianespace completed SES’s first-generation O3b constellation April 4 with the Soyuz launch of four satellites. The rocket lifted off at 1:04 p.m. Eastern from Europe’s Guiana Space Centre near Kourou, French Guiana. The 700-kilogram satellites, designed for broadband connectivity services, separated from the Russian-built rocket two at a time, the first set two hours and one minute after liftoff and the second set 22 minutes later. SES now has 20 O3b satellites in medium Earth orbit. Franco-Italian manufacturer Thales Alenia Space built the Ka-band satellites, each of which carries 20 gigabits per second of throughput. Luxembourg-based SES operates the O3b satellites 8,000 kilometers above the Earth — about a fourth the distance of geostationary orbit where most telecom satellites reside. The proximity of the O3b satellites means less lag time for communications services. SES spokesperson Suzanne Ong said the four new satellites increase the throughput of the O3b constellation by 26 percent. The O3b constellation’s coverage area remains largely the same, she said, fanning out 50 degrees north and south of the equator. Arianespace has launched the full O3b constellation since 2013 using Soyuz rockets carrying four satellites at a time. Since then, multiple companies have started placing broadband satellites in low Earth orbit even closer to the Earth. SpaceX and Telesat have prototype spacecraft, and OneWeb has six operational satellites, all in low Earth orbit. John-Paul Hemingway, SES Networks CEO, stood by SES’s decision to focus on medium Earth orbit, arguing that low Earth orbit systems will face latency challenges similar to GEO satellites because their closer proximity to the Earth means smaller coverage areas, necessitating routing traffic through multiple stops for long-distance communications. Not all operators agree with that assessment. LeoSat, which is preparing a constellation of 108 low Earth orbit satellites equipped with intersatellite links, says it will be faster than fiber for some long distance communications. Hemingway said SES can route latency-sensitive traffic, such as video conferencing, over O3b satellites, and route other traffic like web browsing over its 50-plus geostationary satellites. Hemingway said the influx of investment into constellations of small satellites, as well as other satellite systems, is proof that satellite communications is becoming mainstream rather than a solution of last resort. SES has seven second-generation O3b satellites under construction with Boeing, designed to collectively provide 10 terabits per second of capacity. SES has not selected a launch provider, but plans to have the second generation, known as O3b mPower, in orbit in 2021. For Arianespace, the April 4 launch was its fourth Soyuz mission in less than five months — a cadence that provides practice for its OneWeb launch campaign, which calls for Soyuz launches every 21 days for 20 missions starting later this year. The majority of those launches are planned from Russia’s Baikonur Cosmodrome in Kazakhstan.